After climbing the ladders to the top, around 75 feet up (exhausting!) 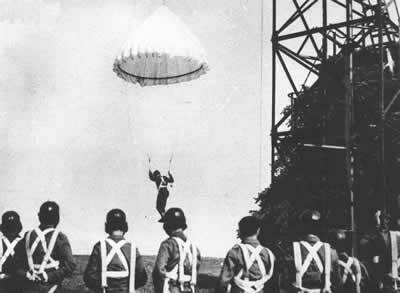 you would be fitted into a harness and then hung under a parachute that was attached by cable to the arm of the tower. 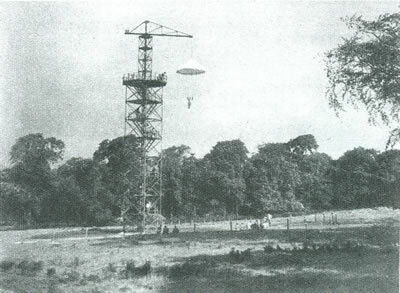 The big balloon parachute on the training tower was fondly called "Dumbo" by the poles, presumably with reference to the ears on Dumbo the Elephant. The instructor would then command in a shouting voice "Go!" of "Skok" in Polish. A button was pressed and the steel cable would run out, but there would be no sensation of falling. At points in the descent the instructor would stop the cable and using a megaphone would relay instructions to you. On landing, many would break their feet, ankles or legs. Many of these were dismissed by the instructor who termed them "too jumpy". 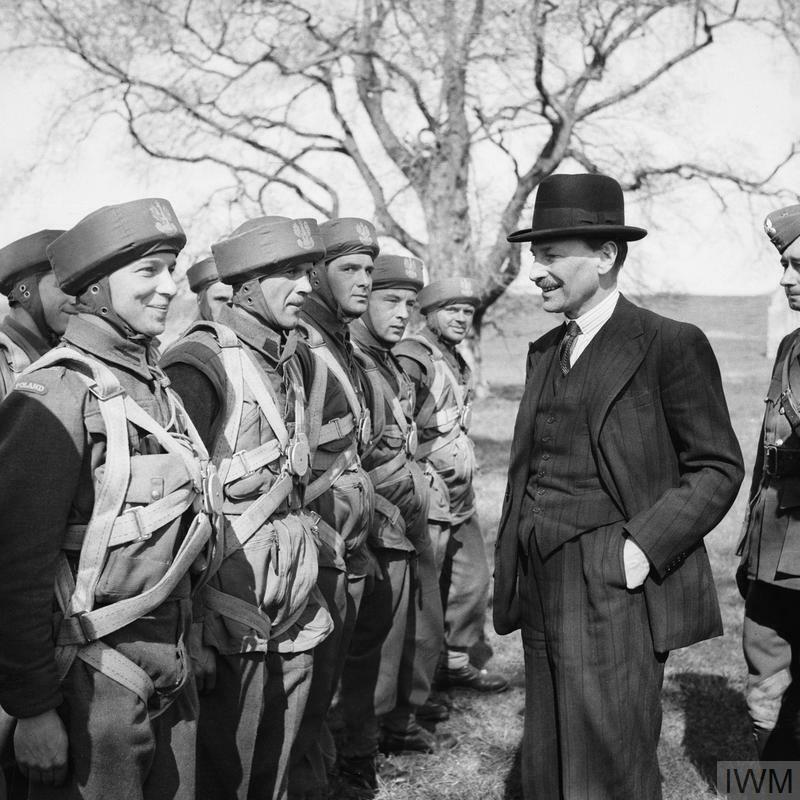 Military observers were astounded at the low altitude of the drop, the parachutists making contact with the ground in less than one minute. 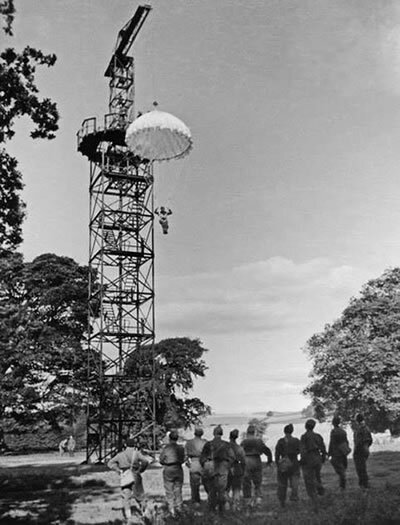 Of course, that was not without consequence, many trainees on the parachute tower broke their legs or injured their knees as a consequence of not getting the landing right. Many of the ideas produced at this site were then copied and used at RAF Ringway. The full video can be watched on this youtube link or you can watch the clip below that goes directly to the parachute tower footage. 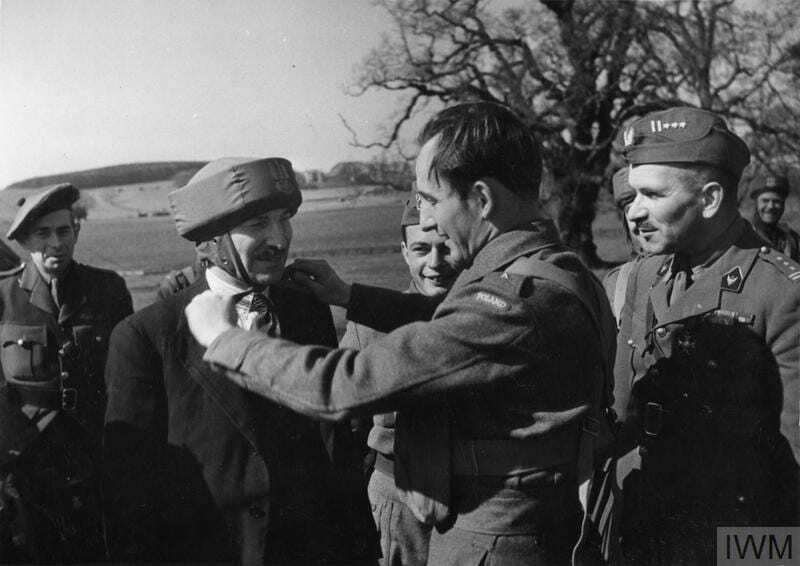 One paratrooper, Stanislaw Jankowski who himself gave a demonstration of the tower to General Sikorski, gives a very good account of what it was like to use the tower. 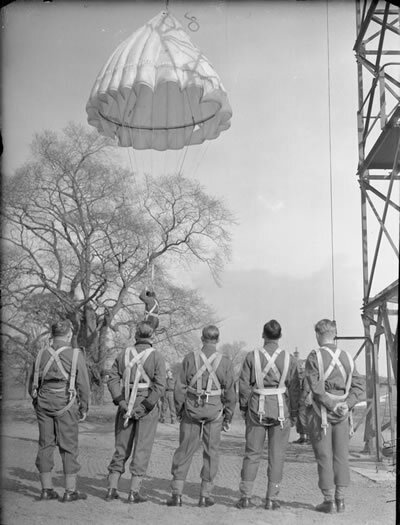 "After this parachute kindergarten they let us go to the tower. A ten-storey high steel structure finished with a platform, from which the extraction arm protrudes - on it a parachute suspended on a string hangs on the rim. Like an umbrella in the rain. The jumper scramble up the stairs to the tower, stands on the platform, gets pinned to the parachute and hop. Falling speed such as with a real jump. This is no feat. But if someone tells me that during the first jump from the tower he was not afraid, that he did not have to break - I will not believe him. I stand like on a balcony, ten floors behind me, earth and an instructor with a loudspeaker, through which he gives me the command: Go - jump! 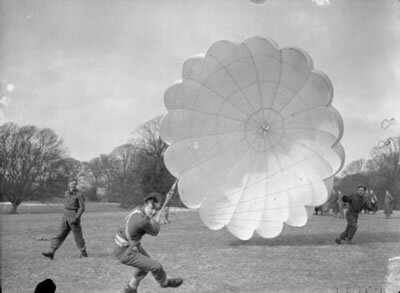 I know that I am pinned so much that the steel cable and parachute will keep me from jumping just a moment ago. But that's all I know. I have to explain it to myself, I have to believe it. And the elegant jump from the tower requires that during the landing you do not stick to the parachute strings, but with your hands along your body, inertly tilt into ten-storey space. The second jump and the next ones were pleasant."